In einer Gruppe von studentischen und wissenschaftlichen Hilfskräften und Mitarbeitern durfte ich von 1978 bis 1983 bei der Datenerfassung und -weiterverarbeitung an diesem Forschungsprojekt mitarbeiten, dessen Ziel in dem Zitat unten gut dargestellt ist (R.W.Bailey, "Old Dictionaries, New Knowledge"). Von 1983 bis 1987 erstellte ich Computerprogramme zur Analyse und Auswertung des Datenmaterials (Fotos). Die Arbeit für Prof. Dr. Jürgen Schäfer (1933-1985) hat mein Studium wesentlich geprägt. "In memoriam - Ansprachen anlässlich der Trauerfeier für Prof. Dr. Jürgen Schäfer"
Schäfers Forschungsarbeit ist ein Meilenstein auf dem Gebiet der "Early Modern English Lexicography". Auf seine Arbeiten wird u. a. Bezug genommen in dem zur Zeit (seit 2005) laufenden umfangreichen Projekt von Charlotte Brewer, "Examining the OED", vor allem im Abschnitt "Role of Quotations - Period Coverage - Early Modern". Just how valuable these early dictionaries are for the study of English was demonstrated on a much larger scale by the late Jürgen Schäfer. (Professor Schäfer's last appearance on the academic scene was in Toronto; just after his return to his family in Augsburg, he died in 1985 at the premature age of 52.) Schäfer studied the precursors of the "hard word" dictionaries of the early seventeenth century, the glossaries often appended to sixteenth-century translations from both the classical and modern languages. These glossarists, he declared, "were not merely indiscriminate copiers but true pioneers in the field of lexicography". Schäfer's work -- brought to publication by his widow, Loretta Schäfer, and some of his former colleagues and students -- illustrates just how valuable these old word lists can be. Like all the rest of us, Schäfer stood on the shoulders of his precursors: those who formed and catalogued the great research libraries; others in our century who compiled the great bibliographies -- in this instance, the Short-Title Catalog by Pollard and Redgrave; still others who filmed or facsimiled scarce books to make them widely available. Schäfer and his co-workers scanned more than a thousand titles in the search for glossaries; devised an encoding scheme using fixed data fields on punched cards (fortunately for us, a now obsolete technology); and published the results. More than 6,000 quotations, as a result, supplement, amplify, and improve the coverage of English words found in the OED. Why, one might ask, was the study of these old word lists worth the trouble? If all the additions were on the order of bumdockdousse, the effort could not easily be justified. 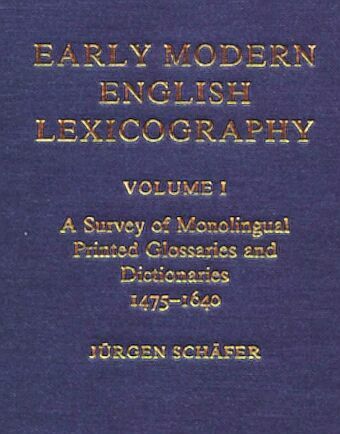 One use of Schäfer's work is to re-write the history of English lexicography. His study of these glossaries shows that the seventeenth-century dictionary-makers were more attentive to actual usage than had previously been thought. They did not mainly anglicize Latin or French words to swell the size of their books but gathered evidence of borrowed words already used in English. Schäfer's attention to minute detail also illuminates the history of the Oxford English Dictionary, a matter previously treated in his Documentation in the OED. Studying what might have been found -- but wasn't -- could be seen as an indictment of the Dictionary; in fact, the rather meagre harvest of all these labours only increases one's admiration for Murray and his successors, particularly when we now know that the collecting was often haphazard and whole sections of the alphabet gathered before Murray became editor were simply lost. But the history of lexicography is a narrow field. If the study of these word lists contributed only to that, it would hardly be worth the effort. Yet much larger questions are invited by Schäfer's work. For one thing, he shows that Shakespeare's lexical originality has been exaggerated. Many words are given in the OED as Shakespearean coinages but they are not. This exaggeration of his importance is partly the result of the attention given to him as the great national poet of England. Some of these "Shakespearean" words -- attractive in Hamlet, for instance -- were, as Schäfer discovered, already in use by others -- as one might expect from a popular playwright aiming at pleasing, rather than puzzling, the audience. From my own viewpoint, as a historian of English, I find the "inkhorn" controversy much illuminated by Schäfer's collection. "Inkhorn" terms were the undigested borrowings from other languages -- particularly Greek and Latin -- thought not to match the "genius" of English but taken straight from the classical ink pot. In the sixteenth century, this battle of ancient and modern worked itself out over such words as the "Saxon" scypman vs. the "Latin" mariner. Schäfer gives us a useful insight into this dispute by showing how touch-line competed with tangent or wisdom-teeth with teeth of sapience. Even more significant, from my viewpoint, are his discoveries about borrowed words from the Americas. In the English Renaissance, anglophone patriots were already beginning to see the "treasure of our tongue" enriched by borrowings from distant languages. In fact, most of the American exotica -- like coca or sassafras -- came from no more distant a spot than Spain. Schäfer, Jürgen. Documentation in the O.E.D. : Shakespeare and Nashe as test cases. Oxford: Clarendon P, 1980. . Early Modern English Lexicography. 2 vols. Oxford: Clarendon Press, 1989. . "The Hard Word Dictionaries: A Re-Assessment." Leeds Studies in English 4 (1990). 31-48. . "Introduction." Ductor in Linguas (Guide into the Tongues) and Vocabularium Hispanicolatinum (A Most Copious Spanish Dictionary) (1617). Delmar, New York: Scholars' Facsimiles & Reprints, 1978. v-xxi. . "John Minsheu: Scholar or Charlatan?" Renaissance Quarterly 26 (1973). 23-35.